As vacation destinations go, Italy is up there with the very best. I never tire of this beautiful country, its friendly people, its great food and wine, its music and culture, its fascinating history. Experience the place just once, and you are clamoring to go back for more. Recently I had the opportunity to go back for more as a Wimco agent charged with meeting some of our local European contacts and viewing villas in Tuscany. Of course, my personal list of things to do was well-padded with restaurants and cuisine. This trip occurred during the latter two weeks of April. I boarded an Alitalia jumbo jet at Boston's Logan airport bound for Rome by way of a connection through Milan. 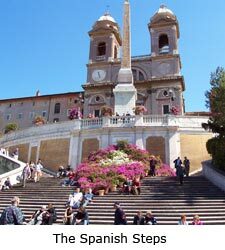 The flight was smooth and upon my arrival I enjoyed a 40-minute taxi ride to the Hotel Condotti just one street from the Spanish Steps. Fellow Wimco employee Nathalie and I would stay at the Condotti for the next two nights, savoring Rome while paying visits to the Hotel Sofitel and a selection of apartments. The Condotti is a splendid small hotel with a cozy lobby and clean, comfortable accommodations. A number of rooms open up onto balconies that overlook adjacent rooftops and back streets. For a weary traveler, it is a welcome place to decompress after a lengthy trip, and if your appetite is up, it is within striking distance of some really memorable eating spots. In a recent edition of Bon Appétit magazine I had read about a pizzeria called Dar Poeta on Vicolo del Bologna in the Trastevere district of Rome. Trastevere is a picturesque medieval borough located on the west bank of the Tiber. Dar Poeta happens to be a local favorite, and I can understand why. We ordered the four-cheese, salmon and arugala pizza and followed it with tiramisu, arguably the best tiramisu of our trip! 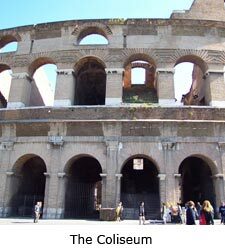 The next day we toured the Coliseum before going to the Vatican and St. Peter's Basilica. Given the passing of Pope John Paul II only two weeks before, the place was packed and naturally very solemn. The cardinals were there for the selection of the new Pope, and music filled the air. The scene was moving. Following a lunch of salmon penne and linguine carbonara at La Locanda del Borgo five minutes from the Vatican, we went to the Forum for a look, then to Piazza Navona—a lively place surrounded by open-air cafés—and finally back to the Condotti. We made the most of the evening without having to venture more than a block or two from the hotel. First we took in a cocktail at Shaks, a trendy little café two doors down, and then we walked over to Ristorante 34 adjacent to the Condotti, a busy restaurant in the classic Roman style with fabulous food and a terrific dose of local atmosphere. The garlic mushroom polenta is beyond description. We got up early the next day, grabbed a cab to the train station and enjoyed clean, comfortable Eurostar service to Florence. What a way to travel! The rail system in western Europe is touted highly, and with good reason. The trip from Rome to Florence took about an hour and a half. 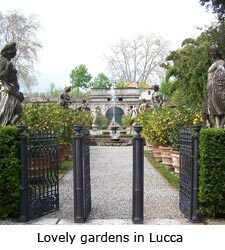 Once there, we jumped into a brand-new Alfa Romeo rental and headed for Lucca. The key to driving in Italy is taking what I like to call the "scenic" route from point A to point B. To appreciate the scale of this country's sights and sounds you need to be on intimate secondary roads with a good Michelin guide at hand. The drive from Florence into Lucca can take as little as an hour, but we managed to nudge two hours plus and in the process we caught a glimpse of Pisa's leaning tower along the way. In Lucca we checked into the three-bedroom apartment Il Mezzanino, our base for the next four nights. It is located in the medieval part of town in a lavishly restored period building. After a brief stop at an outdoor antique market, we had lunch at a cute pizzeria called Fuori di Piazza in Piazza Napoleone where we devoured a great mushroom pizza al fresco overlooking the piazza on a Sunday afternoon, a scene just filled with life.